I must plead guilty to sleeping when Contrapante introduced this Grönefeld to their inventory; I should have been more attentive. They’ve always kept a staggering inventory and this remontoire is no exception. Leave it to the slightly unhinged Dutch to design a constant power escapement like none other in this Grönefeld 1941 Remontoire. The remontoire utilizes two spiral springs in an attempt to deliver a constant unwavering torque through the escapement. This is desirable as single spiral springs deliver a lowering amount of torque as the spring unwinds. This negatively effects accuracy. Most remontoires deliver their power once per second. This remontoire delivers its power once every eight seconds through a governor (thanks to George Daniel’s design), which is viewable through the opened dial. The dial is not our only viewing opportunity, thankfully. Flip it over to observe a very unique series of bridges, designed to resemble the facades of Dutch street fronts, or ‘bell gables.’ All of them are hand-beveled, micro-blasted, then engraved. Screws are all polished to a mirror. All jewels are sat in golden chains to provide visual contrast. The finishing quality is simply staggering. 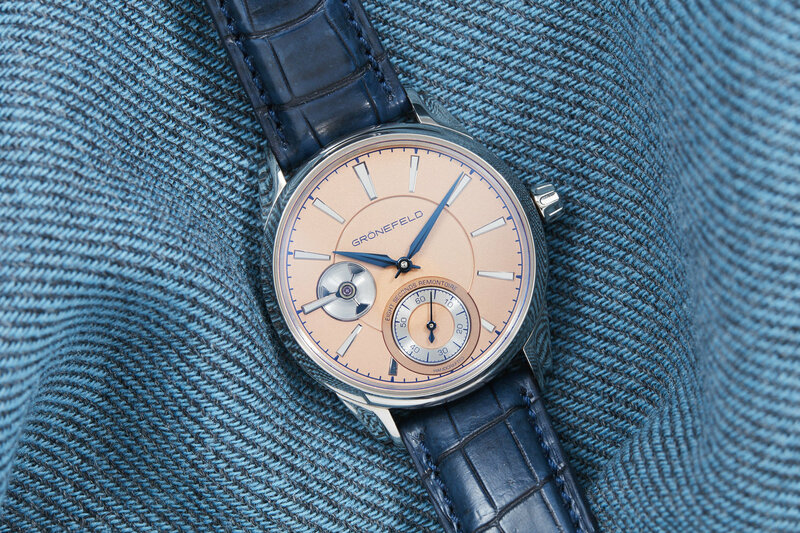 This remontoire is a feat of modern watchmaking. At 1/188 examples produced, there aren’t many to go around. Especially in this lovely salmon & silver aesthetic, it’s bewitching. No wonder GHPG awarded this piece ‘best watch’ a year back. It is the sort of piece that will take time to find a correct collector, but a sure investment. Whoever they are, I envy them. Deeply. Find it here for 45000 USD.